It’s being called the “Adblock Paradox”: The counterintuitive fact that adblock actually causes a site to lose traffic over time. Most of us think that using an ad blocker makes reading web pages more enjoyable. So it would be natural to assume that Adblock use would be tied to increases in overall web traffic. But according to Pagefair’s research, the opposite happens. When users visit a site with adblock turned on, that site eventually starts to lose traffic. Why do adblockers cause sites to lose traffic? Because adblockers eventually “starve” a site of its necessary revenue. That revenue loss causes the site to cut down on expensive content development — or to cut back on quality. Over time, the decreased rate of content production causes the site to become less interesting and relevant, and traffic begins to wither. “This is a vicious cycle”, says ReviveAds CEO Mark Bauman. 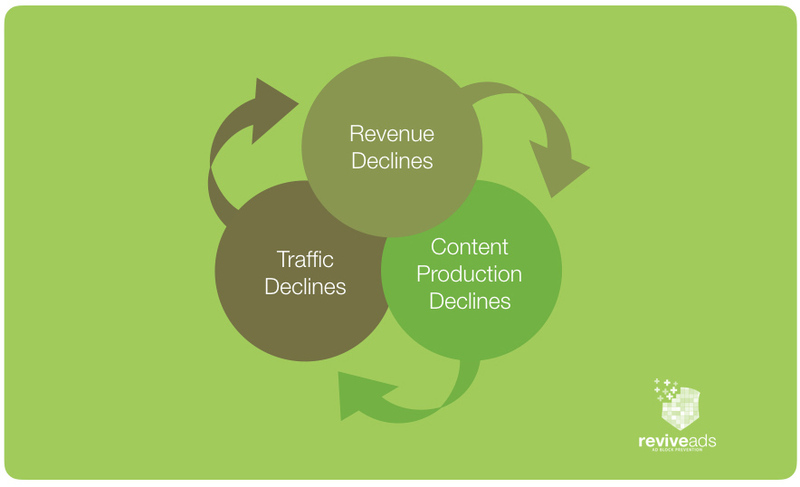 “Once sites begin to cut back on their content due to revenue loss, traffic loss isn’t far behind. And once traffic starts to go down, the writing is unfortunately on the wall. Getting revenues back up is going to be hard. The important thing is to protect revenues now and prevent any required cuts to content production”. As the chart above shows, the initial effect of adblock use is that traffic does indeed increase. But within 2 years, that effect reverses and site traffic begins to decline. What’s the answer to the adblock paradox? Websites need to be vigilant about their revenue. Revenue decline causes quality decline. Quality decline causes traffic decline. Traffic decline causes more revenue decline. The cycle is a common one and can destroy publisher earnings. Once earnings are down, it can be very difficult to rebuild traffic. (Ad reinsertion refers to the practice of serving ads past adblockers. For more information on ReviveAds and reinsertion, see the latest whitepaper here).